Am Cocker Spaniel Dog Ornament - cast from original woodcarving and hand painted. 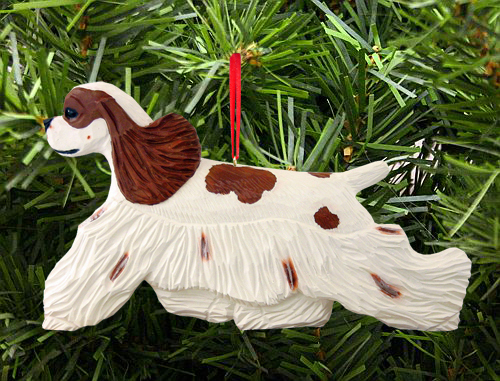 Our Am Cocker Spaniel Dog in Gait Ornament is the perfect addition to your holiday decor. The ornaments measure approximately 5" W x 3" H (depending on breed). The back of the ornament is flat - and the Red Ribbon and Hook are included. Custom Made upon order. Made in the USA. Order early as these are quite popular ornaments!